So how did this North American classic stand up to its very British rival, the bourbon? Value for money? A unanimous yes!! Bourbon, pah! 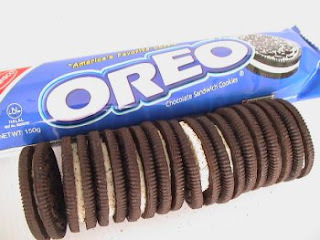 Long live the Oreo! Who can resist the Oreo's black & white charms? Good all rounder. Maybe a little sweet though? A great biscuit which exhibits a satisfying mixture of sweetness & austerity.